a small cavity or chamber, as in the brain or heart. 1. the rhomboid fossa, especially its lower end. 2. cavity of septum pellucidum. fifth ventricle cavity of septum pellucidum. fourth ventricle a median cavity in the hindbrain, containing cerebrospinal fluid. ventricle of larynx the space between the true and false vocal cords. lateral ventricle the cavity in each cerebral hemisphere, derived from the cavity of the embryonic tube, containing cerebrospinal fluid. left ventricle the lower chamber of the left side of the heart, which pumps oxygenated blood out through the aorta to all the tissues of the body. Morgagni's ventricle ventricle of larynx. pineal ventricle an extension of the third ventricle into the stalk of the pineal body. right ventricle the lower chamber of the right side of the heart, which pumps venous blood through the pulmonary trunk and arteries to the capillaries of the lung. third ventricle a narrow cleft below the corpus callosum, within the diencephalon between the two thalami. An unofficial name for the space between the two laminae of the septum pellucidum inside the brain. the single fetal cardiac ventricle, formed by the looping of the bulboventricle; divided later by the growth of the interventricular septum as a projection from the wall of the bulboventricle. the median cleft between the two laminae of the brain's septum lucidum. a median, horizontally disposed, rhomboid cavity in the hindbrain, between the cerebellum and medulla, containing cerebrospinal fluid. a variably developed cavity of the larynx that opens into the laryngeal vestibule by a cleft between the vestibular and vocal folds; well developed in dogs and horses and especially certain apes. 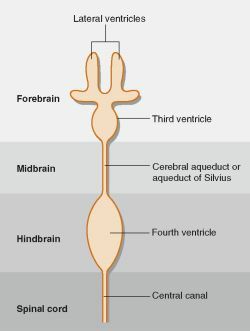 the cavity in each cerebral hemisphere, derived from the cavity of the embryonic tube, containing cerebrospinal fluid and communicating with the third ventricle. the lower chamber of the left side of the heart, which pumps oxygenated blood out through the aorta to all the tissues of the body. an extension of the third ventricle into the stalk of the pineal body. the lower chamber of the right side of the heart, which pumps venous blood through the pulmonary trunk and arteries to the capillaries of the lung. a vertically disposed, ring-shaped space that contains cerebrospinal fluid and that communicates anteriorly with the lateral ventricles and caudally with the cerebral aqueduct within the diencephalon between the two thalami.